As mentioned on my previous blog post, I spent way too much time last weekend researching the perfect stapler. David Allen recommends "a good old-fashioned stapler you can slam with your fist or your hand", but the one he uses (the Ace Pilot) can be hard to find. I've found another good stapler that "you can slam with your fist": the Isaberg-Rapid K2 Classic II, designed and made in Hestra, Sweden. Actually, this stapler was designed in 1944, and it sure looks like it. 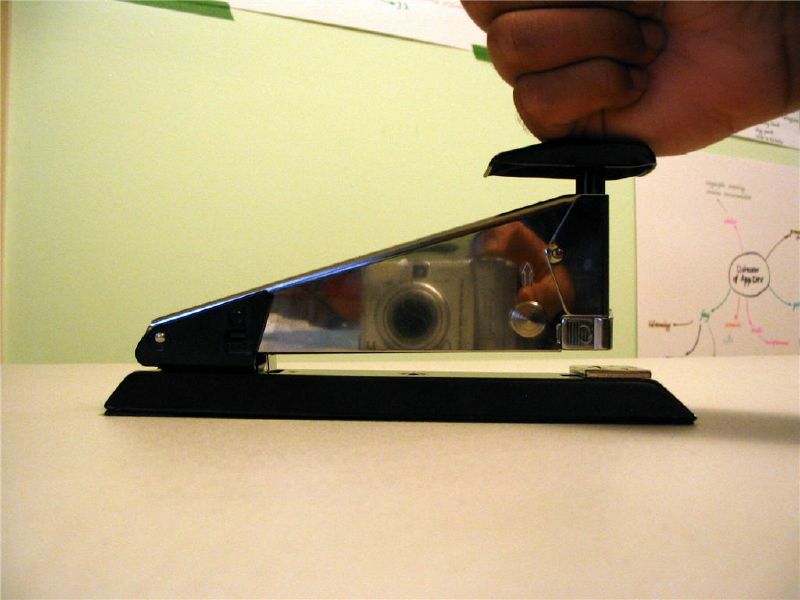 This is truly a stapler you can pound. It can handle 20 sheets with standard 6mm staples, or 50 sheets with 8mm staples. The other stapler I was considering was the PaperPro (also known as the Staples One-Touch), which has a stapler-gun mechanism inside. But some reviews indicate that it breaks down after 6 months or so. posted by Jonathan at 6/21/2008 10:18:00 p.m. I think my wife's favorite ever present that I got her was the hole punch that lets her do a whole screenplay in one go. By Thomas David Baker, at 6/22/2008 8:58 a.m. Very nice, Tom. You have to send me the link to that one! By Jonathan, at 6/22/2008 9:22 a.m. I saw a stapler at work that was "eco-friendly". It doesn't use metal and staples paper together by folder paper. I think it can only handle 2 sheets, or at least very few, but its interesting. By Johan Cyprich, at 7/01/2008 8:51 a.m.
Ah yes - I've seen that one. Haven't tried it though. By Jonathan, at 7/01/2008 6:11 p.m.